This is a great picture! 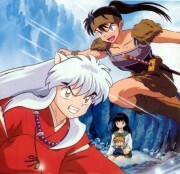 Nothing cracks me up than to see Kouga and InuYasha fighting, with Shippou acting like that there is nothing happening. Great scan - I'm glad you submitted it. The only problem is that my Kouga was on the fold :( . Can I use this for a wallie? waa~! the scene is so cute.... Elledies-chan thank you for sharing the scan.. 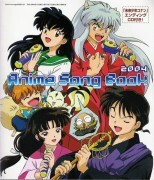 Although i can't download it yet... hehehe.. :sweat: but that's ok ^_^' i enjoy it even by looking at it.... Ganbatte ne~! Sayonara! thaaaaaaaaaaaaaaaank!!! i like very much this photo!!! jejejejejejjeejjeejejej!! noooo!!! I have to be level 10 to look at the bigger image, though it looks very funny. XD Lol, fighting over food, so like them... -Sighs- I thinks its kind of odd to know someone without ever meeting them first hander. nice pic. i like to watch inuyasha and kouga arguing about stuff. 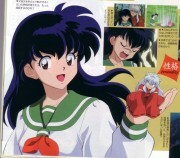 (and inuyasha beating shippo up) and i have a small question for the first guy who posted. whats kawai? This is a lovely composition. Gifts to distract the combatants perhaps? Cool. Thanks for sharing. 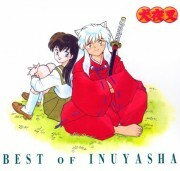 i love kouga so much and inuyasha's a jerk make up your mind inuyasha! CHOSE THE GIRL YOU LOVE ALREADY! lol oh man to funny thanx! 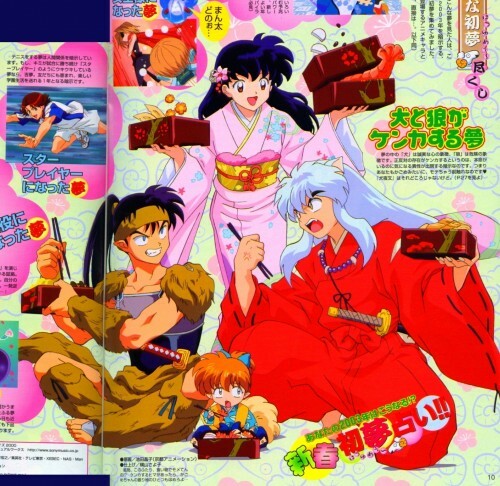 I wonder if Koga knew what he was eatin'...hmm. esta serie tambien me enkantha!